Chalet Information: Tastefully and Fully Furnished, 4+ Bedrooms & 3 Baths, Well-equipped Kitchen, Syracuse China and Oneida Flatware (Setting for 12), Corning & Revere Cookware, Washer/Dryer, 3 Mountain View Balconies, Leather and Tapestry Living Room Set, TVs in Most Rooms, Laser Printer and Wireless Internet (Wi-Fi ), Ski Tuning Bench \ Game Room, Weber Q200 BBQ Grill. Please No Pets & No Smoking in Residence & on Balconies. IMPORTANT: Deposits are separate from rent and may be used to cover interior or exterior property damage caused by tenants and/or their guests. Deposits may not be used for or applied to rent. Renter will be responsible for full rental fee, cleaning fee and covering all damage costs; including labor to repair damage. NOTE: Please remove shoes in the tuning room while using this home. Our carpet is very light in color. The use of indoor only shoes is acceptable. Removing shoes helps maintain the carpets in clean condition. Keywords: Upscale Ski Chalet Rental, Organization Rental, Special Events Rental, Mountain Home, Single Family Dwelling, Cabin, Home, Offstreet Parking. We are interested in forming long term relationships & providing leased lodging for Industry Reps. & National Teams. Our value & pricing for lodging in Government Camp is very competitive. Alltitude Chalet can uniquely meet your needs. It’s an upscale chalet ran by avid ski racers for ski racers. 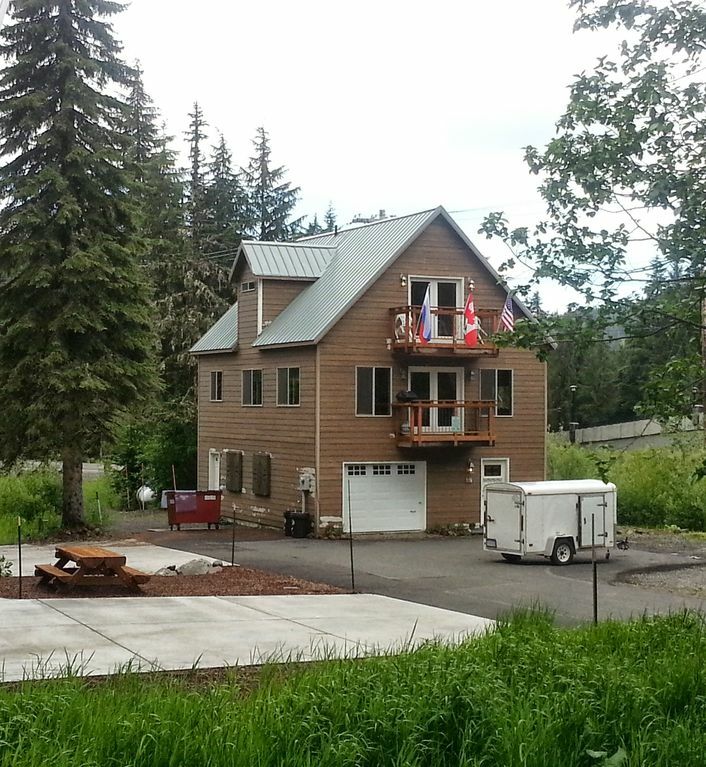 Alltitude Ski Chalet is 2300 sq ft and has a fully furnished kitchen, washer\dryer, sheets & towels are provided & the tuning room with powder coated ski & board racks. We have off-street parking for trailers and up to 3 vehicles. We look forward to speaking with you & discussing your organizations leased rental needs. Skiing and ski racing is our passion. We choose Government Camp, Oregon because there are so many thing to do and see in the area. We chose to rent so others can enjoy the beauty, recreation and year round training facilities available on Mt. Hood . We are located in the Heart of Government Camp, Oregon. We are a 2 minute walking distance from the center of town. The home has an outdoor firepit. Due to the limited number of homes on the street retains ample parking for vehicles and team trailers at all times of the day and seasons. We are adjacent to Parmelee's Swiss Style Chalet which sleeps 10. Timberline Ski Resort, Mt. Hood Ski Bowl, Mt Hood Meadows Cooper Spur, and Mt. Bachelor are the local ski areas. Mt. Hood is viewable from the Bear Springs Room and the Living Room Balcony. A view of Ski Bowl is available from the Elk Meadows and Wolf Creek Rooms. We are walking distance from Mt. Hood Ski Bowl and Summit Ski Area. The mountain air is cool and each room has a fan. No AC is necessary. Cabella's American North American Bedding. Gas Fireplace is turned off in the summer unless requested. There is parking for up to 6 cars using off and on pavement parking. Dishwasher soap under kitchen sink. Government Camp Cable Television is provided. Netflix via Amazon fire stick. There is a library of DVD titles to choose from. There are many titles to choose from. (3) Livingroom, Bear Springs Room, Elk Meadows Room. Yard is being leveled and undergoing ongoing landscaping. Golf resorts are located in Welches. My husband and our two kids stayed at Alltitude while our oldest was at ski camp at mt hood with Burke Mountain Academy. This location availed us easy access to the mountain to drop our youngest off each morning and great access to town and bike trails. The house was large and easily accommodated us and could have accommodated many more. It was very clean and well stocked with laundry soap dish detergent paper towels etc. it was a very comfortable stay in our host was easy to work with. We would definitely stay there again in the future. Alltitude Ski Chalet Welcomes The Olympic Winter Institute of Australia & Zealand Academy of Sport - South Island Winter Performance Program to Government Camp & Mt. Hood, Oregon U.S.A. Australian Head Coach, Ben Wordsworth, and New Zealand WPP Head Snowboard Coach, Tom Willmott, are back in town for three weeks of training on the 22 ft Olympic Pipe at Timberline. We wish Australian athletes Holly Crawford and Nate Johnstone as well as the New Zealand riders Juliane Bray, Rebecca Sinclair, Kendall Brown, James Hamilton, Ben Stewart, Paula Mitchell, Mitchell Brown and others our best in the upcoming 2010 Vancouver Winter Olympics. Please reach out to us if you have weddings or special events.